Job-shop manufacturer Connecticut Coining Inc., Bethel, CT, recently went in search of a 100-ton die cushion with 10-in. stroke, and adjustable force during the press stroke, holddown and a controlled return. In addition, it asked its supplier, Dayton Die Cushions, Eden Prairie, MN, to provide a cushion with inexpensive yet accurate mounting and the ability to handle off-center loading. Also, it would have to fit into a restricted space in the press bed, and would have to integrate easily into its current PLC and hydraulic system. Cushions require some degree of piston and cylinder overlap to provide adequate guiding. Because the bed of the press was relatively shallow and lacked bed guides, fitting a 10-in. stroke required sacrificing a significant portion of the necessary overlap. The restricted bed dimensions required Dayton Die Cushions to add its own bed guides in the approximate manner of a four-post bearing-guided die set. These four posts and their fit into the mounting plate had to be accurately machined to within 0.001 in. with a high degree of parallelism. The press mounting also had to match these parameters. Because the cushion had to be mounted suspended off of the bottom of the press bolster plate, Dayton Die Cushions machined the bolster to similarly high tolerances. To manage costs, it drilled clearance holes in the bolster with countersunk recesses for the suspension rods, to allow attachment with a nut from the topside of the bolster. This eased the drilling and assembly processes. And, to ensure the required level of accuracy, the firm machined a highly accurate template. It used the template for mounting-rod stabilization during shipment, and then attached it to the bottom of the bolster to provide the required press fit. To handle off-center loading, the cushions carries high-definition linear transducers to measure and compare loading at each corner. The PLC can command remedial action to correct an unbalanced condition. The transducers also can provide long-term baseline information for cushion or die-pin wear. Finally, the entire cushion design was created to fit and complement the press characteristics. 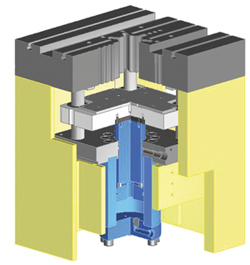 D&H Electrical Consultants, Durham, CT, integrated the design into the press PLC; C & C Hydraulics, Terryville, CT, plumbed the cushion’s hydraulic system into the press.